Anyone who knows me knows that fashion is NOT my middle name. I am not that girl who has hundreds of handbags and a closet full of shoes. I might have 5 pairs of shoes and 1 bag to my name! This year though, I want to upgrade my wardrobe from only yoga pants and hoodies to a better look overall. Still me, but outfits or pieces I can wear comfortably throughout the day when at events. I typically carry around a Northface backpack that I love – I can take it anywhere from the coffee shop to a hike on a glacier and all of my electronics are safe inside. But, you know what? It isn’t that flattering on the CES show floor! 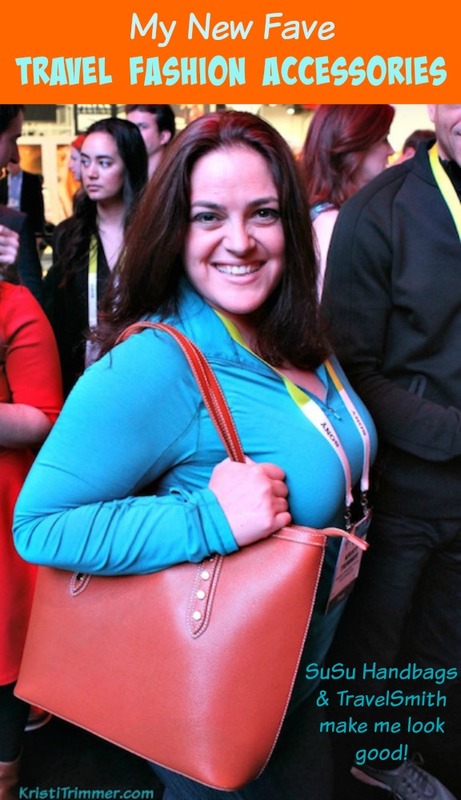 But you know what is… this beautiful SuSu Leather Handbag! Here are the details on this bag! I get asked almost weekly about this bag! I love it! It fits my MacBook Air, has a pocket for my cell phone and another zipper pocket too! I sometimes wish it was slightly wider to fit my Canon T3i, but alas, we can’t have everything we want! I use this SuSu Handbag everyday now – at least when I am working from a coffee shop, not necessarily when I go hiking! Oh, and I am seriously debating in getting this in another color. What would you get? I just looked and it is on Clearance from $89 to $46.99. Love a good Clearance Sale! I love the bag. Thanks for sharing. That’s an amazing bag! I would love to have it for my travels!